Today we decided to download Rick Steves app of Venice, and have a “Tour of Venice with Rick Steve”. Here in Italy food is so important and especially breakfast. So what’s for breakfast?…..Pizza Of course! Well it is Italy and nothing beats last nights pizza straight out of the fridge. Especially when it’s a good one like the one we got from Positano’s. Christiano had laid out a good spread for breakfast. All different sorts of juices, cereals, cakes, tarts, biscotti, fruit, tea and coffee were laid out for us. A nice breakfast and a chat with Christiano a nice way to start the day. After looking over Christiano’s suggested itinerary last night we decided to buy a three day pass for €40. 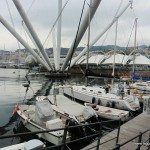 It gives us access to all the ferries, buses and public transport. As we’re staying in Venice for four nights that suits us perfectly. It’s no cheaper to take the bike so we’ll leave it in the warmth for a few days. There’s a great public transport system connected to Venice which encourages people to leave their vehicles at home. The charges are One way Bus € 1.50 (on board € 3) So buy it at a newsagent. One way vaporetto (Water taxi) € 7.50 (lasts 60 min). Airport € 6. The Tourist Pass which gives access to all buses and Vaporetto costs 24 hour €20, 48 hour €30 and 72 hour €40. So working on those costs for us it’s more economical to use a tourist pass. By the end of our time there we had used up more than €74 of transport so it was well worth it. Christiano also told us the Alilaguna 4 1/2 hour tour of the islands. 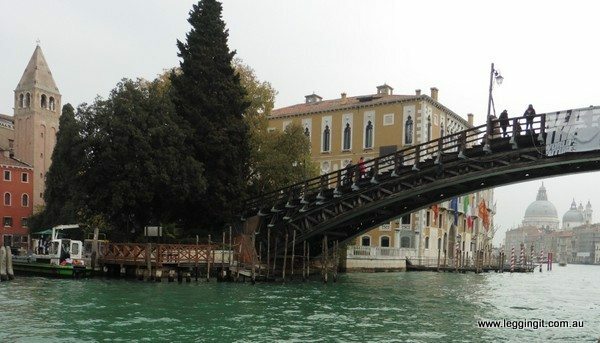 It was a guided tour using the Vaporetto to Murano for a glass show, Burano for lace and pizza demonstration, and also to the island of Torcello. It sounded pretty good but we already had a list of things we wanted to see. Combining this with the list that Christiano gave us last night should keep us well and truly busy for three days. The bus stop was a short walk away from the B&B and the buses were quite frequent. Arriving in Venice our first stop was Piazzale Roma, the main bus terminal which is close to the Ferroria (Ferry Terminal). 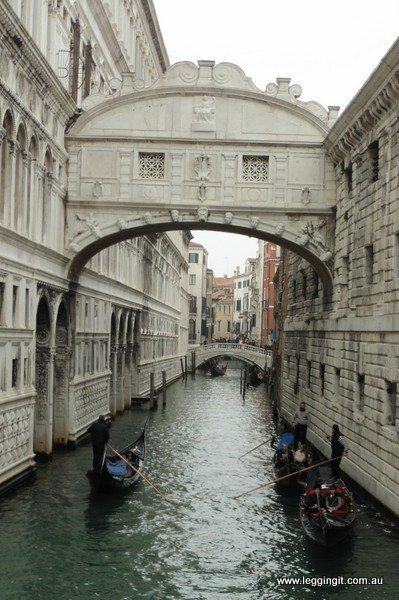 With our downloaded Rick Steve’s app, this one the tour of Venice. After orientating ourselves we headed for the Vaporetto which surround Piazzale Roma. We boarded the Vaporetto (Water bus) Number 1 for a trip down the grand canal with Rick giving the commentary as we sailed past. Wow, there were so many grand old buildings and canals along the way. The city is slowly sinking and the water damage to lots of buildings is quite evident in the decaying plaster. Supposedly the council prevents any changes so the buildings are slowly rotting. According to Rick some people even abandon the lower floor of their building due to rising damp. 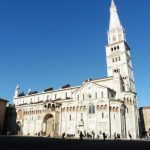 After all the pictures and stories of Venice it was quite sobering to discover from Rick Steve that at least a third of the population have left and now only about 50,000 Venitians live there. 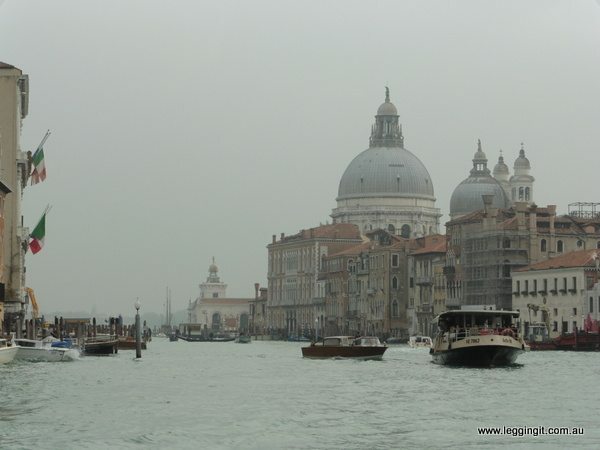 Although Venice gets at least 8 million visitors per year the population is dwindling at about 1,000 people per year. According to locals despite subsidies Venitians just cannot afford to live in the city anymore so they choose to live out in the new suburbs. 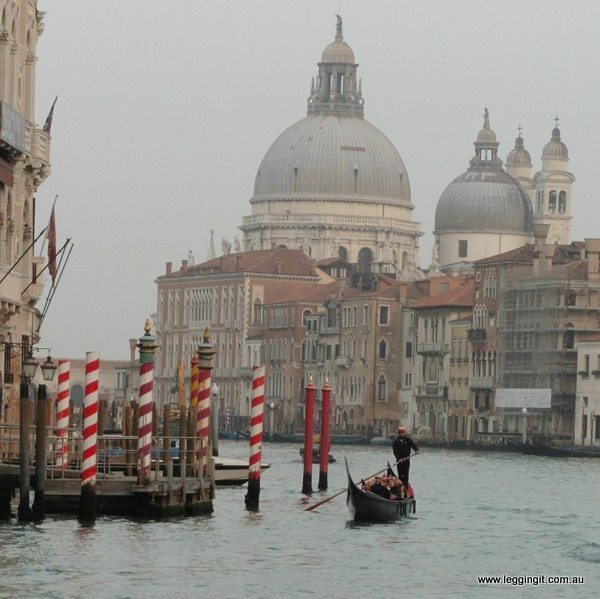 As such the real culture of Venice is slowly disappearing and the people go there just to work in the tourism industry. Rick Steve rightly makes the observation that we should enjoy Venice now before it becomes a museum city. Wandering around the main part of Venice the words ring true because there’s heaps of shops and tourist attractions but not many places where you find locals hanging out. However, if you take a wander through the backstreets and lose yourself eventually you’ll find a local bar (Ostello). They serve nibblies on the bar, the coffee’s cheap and they serve a local spritzer with a kick like a mule that really puts a spring in your step. It maybe the reason Venice is called the City of love everyone’s happy and loving due to copious amounts of spritzer. All around the hotels and smaller canals there’s no shortage of gondaleers with their traditional striped shirts and straw boater hats spruiking in the hope of getting a tourist fare. At €80 a pop it’s not a cheap venture. Luckily riding in one was not something we were interested in doing. There is a cheaper option, take the local cross canal gondola for €2. 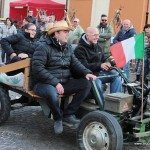 However, there’s plenty of tourists who are willing to shell out the big bucks however to get what they see as an authentic Venetian experience. Seeing them being paddled down a canal with so many selfy sticks sticking out recording the experience it’s a crack up. Looks like a floating porcupine. The locals of course use the €2 gondolas and it’s funny seeing all the locals all standing up texting as the gondola crosses the canal. 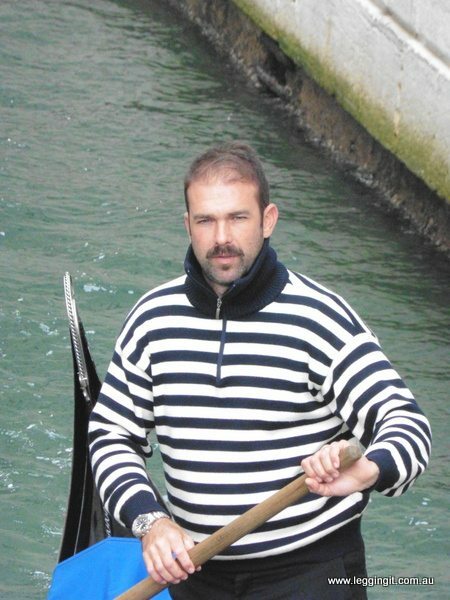 For us using a gondola is so exotic, but for them it’s just getting across the canal. 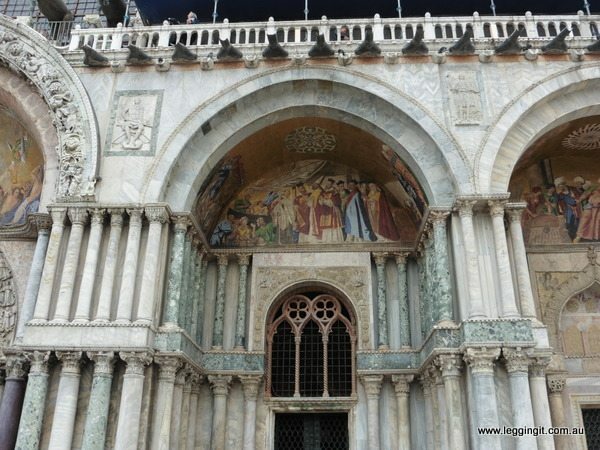 Not far from the San Marco Vaporetto terminal is the Basilica Cattedrale Patriarcale di San Marco, in San Marco square. A word of caution do not take a picnic lunch in this area because there’s fines up to €500 for anyone picnicking. The Basilica is one of the most ornate structures we’ve ever seen. The current structure dates from 1073. 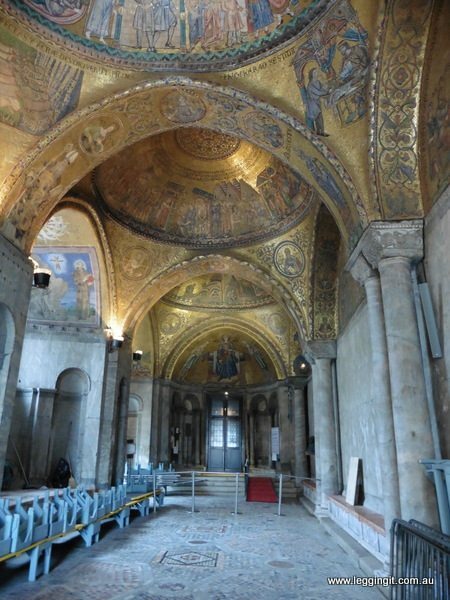 Earlier churches housed relics of San Marco (St Mark) which were rediscovered hidden in a pillar in 1094. The exterior roof consists of five domes forming a cross and interconnecting roofs. The interior of the basilica is to be seen to be believed. The floor is covered in all sorts of mosaics, from geometric designs to fancy peacocks. Meanwhile the walls and domed ceilings are covered in mosaics of bible stories etc surrounded by golden tiles in Byzantine style. It reminded us of Russian Orthodox churches and Winchester Cathedral in London. Unfortunately no photos were allowed but it truly was an amazing place- this photo was taken in the foyer to give you an idea of how it looks. 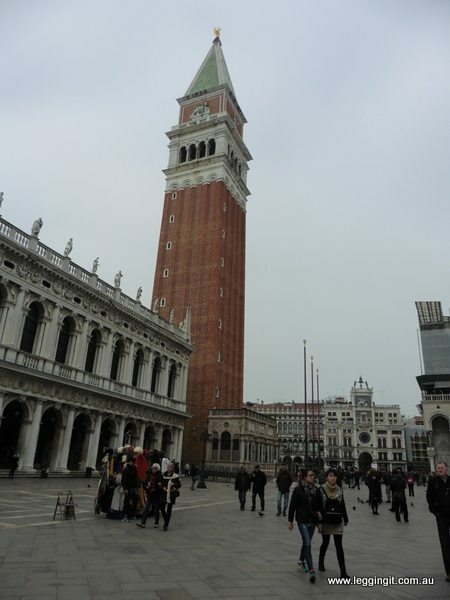 Opposite the Basilica is San Marco Campanile (St Marks Bell Tower) which has a great view over Venice. However, as it’s so foggy we didn’t climb up. The fog really affected our ability to take long scenic shots. Around the Piazza there’s ornate buildings like the Procuratie Vecchie from the early 1500’s and Procuratie Nuove from the late 1500’s. Napolean loved Venice so much he even put a building in the square. There’s heaps of outdoor cafe’s and restaurants around the piazza which charge like a wounded bull. If like us that’s not your thing a few streets away there’s local cafe’s selling good coffee at reasonable prices. 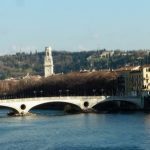 We headed down the Merceria through the archway beneath the Clock Tower (Torre dell’Orologio), towards the area known as the Rialto. 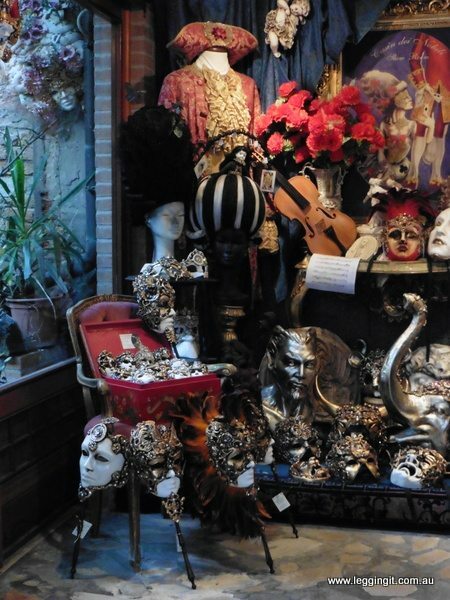 It’s an area where there’s lots of brand name shops, and shops selling all the locally made products like Murano glass, Carnivale masks and Burano lace. Some sneakily also sell Chinese copies like the ones above. Our friend told us to lose ourselves in this area so we did, eventually finding a quiet area with no tourists. There were a few coffee shops, grocers and bakeries. The best place to stop. It was nice to wander the streets and along the canals,without a tour guide traipsing past with a flag held high with thirty people all bunched up behind them with selfie sticks pointing in all directions. Following Christianos itinerary, after lunch we crossed the Accademia Bridge and headed towards Piazzale Roma. At Calle Toletta the oldest bookshop and publisher in Venice, La Toletta stills eaks out a modest existence. 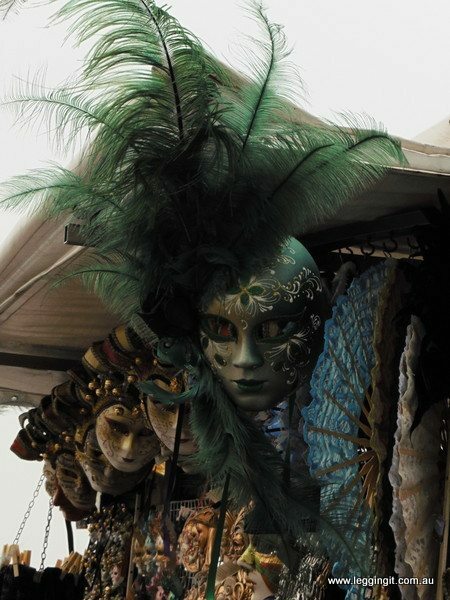 Not far away are the famous masks of Carnivale. All sorts of papiermachete creations adorn the walls of the showroom as an artist decorates her latest creation. Just fabulous. 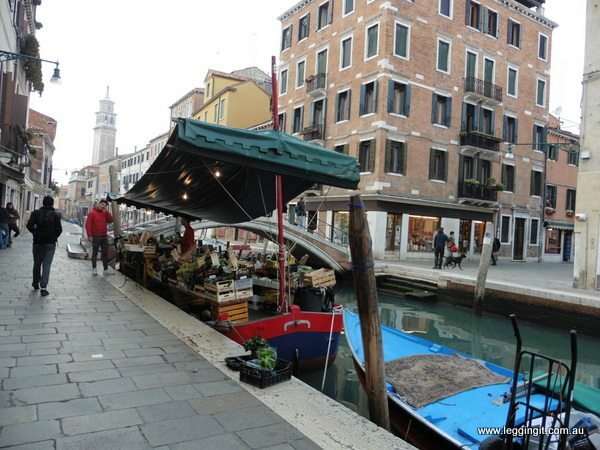 Not far away was Campo San Barnaba where the traditional fruit boats still sell their fruit and vegetables on the canal. On the bridge near the boat four footprints in white marble had us puzzled. Two drunks from the local bar stumbled up onto the bridge, put a foot on a footprint and started shaping up. We realised we had stumbled across a “Bridge of Fists”. The bridge of fists were bridges where local clans would square off against other clans. The idea was that your clan would toss anyone from the other clan into the fetid canals. It became pretty popular with rich men betting on the outcome and clans practicing. Nobody ended up in the canal today and we ended up in Campo San Margherita looking for a cafe. There were heaps of cafes there and although it was suggested we try a spritz it was coffee only. Our last stop for the day was San Zaccharia Church. It’s a former monastery of gothic design from the 1500’s which is covered internally with paintings by all different artists. It was strange to be looking around the church as the church guardian dozed in his chair in front of the chapel to the Virgin Mary. At first we thought he was praying but the tilt of his head soon gave it away. 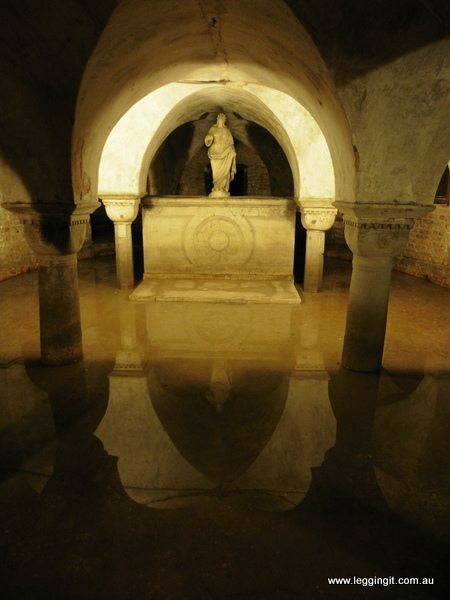 It is also a good example of how Venice is sinking as the crypt in the basement is flooded giving it an eerie feeling. As it was getting dark we headed for the Vaporetto and headed back to Piazza Roma, to catch the bus home. Tomorrow we are heading out to the islands around Venice.